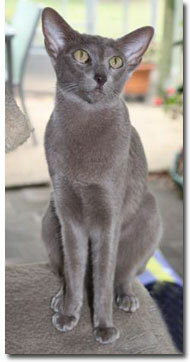 At Cat Malu we breed beautiful Oriental & Siamese cats suitable for Pets, Show & Breeding. Our exhibition of Oriental cats began in 1996 in NZ with GD CH Montpelier Black Ice & Ch Mkuzi Malindi. Then after moving to Australia, we continued with ACF AOE Platnium. CCC of A DGCh.QFA & FCCQ Ruby DG Ch Silverize Jerry Hall, who achieved Cat of the Year 2004 & 2005, Best of Breed 2003 & 2005. Malu Richie McPaw at 17weeks old achieved best shorthair kitten & supreme shorthair cat in the february 2011 Gold coast cat club show. see him under our stud page. He is now ACF Diamond,QICC Argyle, QFA Emerald ,FCCQ Emerald double grand champion & Oriental of the year 2012.group 2 cat of the year 2012,2013. Our Siamese and Oriental kittens are brought up in our home, which means they get lots of individual attention. This ensures they are familiar with all the household noises and gives them lovely temperaments. They are litter box trained & have learnt to socialise with other cats. To see more about our kittens, visit our kitten page.